Its goal: determine how social media marketing is being used to grow and promote businesses. Check out the report’s highlights below, and download your copy for additional insight, full statistics and details. 57% were from the United States. Note that a link to the survey was distributed and shared via social media (largely, on Twitter) and sent to an email list of 120,000 marketers by Social Media Examiner. Therefore, the following survey results are likely skewed in favor of more social-savvy marketers. This does, however, present a great learning opportunity for those at the beginner or novice level. 51% of respondents use social primarily for B2B marketing efforts, and 49% use it primarily for B2C. To me, one surprising finding on the B2B / B2C usage was that those who claimed to be primarily B2B respondents have been using social media longer than those who call themselves B2C-focused. However, this could be a bias of those polled. What questions do marketers have about social media? How much time is put into social marketing efforts? What are the benefits and results of social? What social media platforms are most commonly used? What are the social platforms marketers want to learn more about? Compare the results to the way you’re currently using social media, and use some of the responses as a guide when developing your company’s strategy, implementing programs, and evaluating the return of social media marketing. "What question about marketing with social media do you most want answered?" was an open-ended survey question that garnered more than 2,700 responses. The topics that marketers want to learn about most are measurement and audience targeting. How to measure ROI, track performance over time, choose the best tools for sharing, and know the industry benchmarks to measure against are top of mind in terms of social media measurement. For targeting audiences, marketers are interested in finding the best platforms to connect with their buyer personas, as well as how to determine audience sharing habits, and how to target a specific industry or region on social media. Another question marketers have: How do you use social media to sell and convert? 58% of marketers using social for more than three years report that social has helped improve sales, but 60% of all respondents report that it has not. 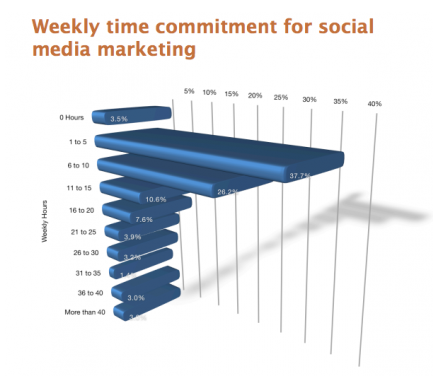 How Much Time do Marketers Commit to Social Media Efforts? Since 2011, managing the time commitment for social media rose in the ranks from No. 10 most-asked question among respondents to No. 5. This could be because executives realize they need to get involved, and/or because of new platforms emerging (Google+ and Pinterest are two examples). If you’re struggling with time commitments for social marketing, check out another PR 20/20 resource—Find Time for Social Media: How To Map Out a Plan for the C-Suite. The chart below shows time put into social media each week. 59% of respondents use social for 6+ hours/week, and 33% use social for 11+ hours/week. More experienced social media users (those that have been active for more than 3 years), spend more time on social each week than novice social marketers. Results also indicate that marketers may be slowly increasing social media outsourcing since last year—in 2011, 28% outsourced social, and in 2012, this climbed to 30%. Perhaps a negligible change, however something to keep an eye on over time. The need for outsourcing may be related to finding the time for social media activity. What are the Benefits and Results Marketers Rank for Social Media? Respondents’ top three benefits of social media marketing include: business exposure (85%), increased traffic (69%) and marketplace insight (65%). Generating leads and developing fan loyalty ranked close behind, each with 58% of marketers indicating these benefits. 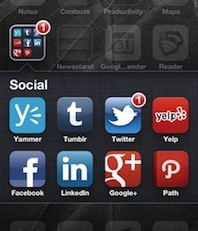 What are the Most Commonly Used Social Media Platforms? After Google+, marketers ranked photo sharing, forums, social bookmarking, geo-location, then daily deals respectively. Dips in popularity from 2011 results to 2012 results were seen among social bookmarking, forums and geo-location. Many marketers that responded to the survey are looking to video as social media marketing’s next big thing. Rich media, like video, is often given prevalence over written content by search engines, which may be a driving factor to its potential rise. Interested in more details? Download your copy of Social Media Examiner’s 2012 Social Media Marketing Industry Report to see how your efforts compare with other marketers. 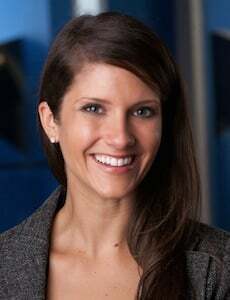 Jessica Donlon is client services manager at PR 20/20. Follow Jessica: @jessicadonlon.